Here is an indispensable document when working on your Honda VFR750R. This parts book is very difficult to come by. Honda will no longer sell you one, not sure if they ever did sell them. 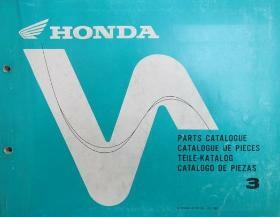 This particular parts book is for the 1988(J), 1989 (K) and 1990(L) models. It covers all RC30 models except the 1987(H) Japan only and 1990(L) USA versions. This is a large PDF file so be patient while it downloads. Click on the parts book below to download/open it.